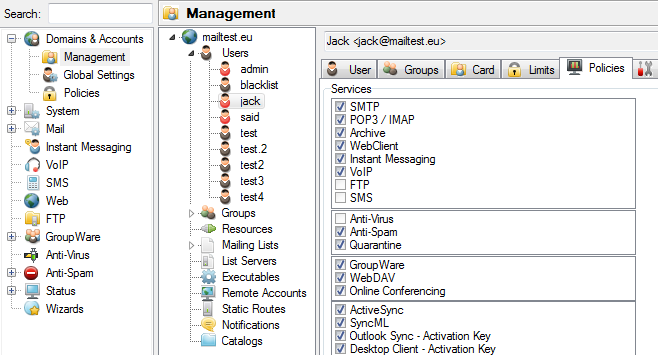 Services can be enabled or disabled by user, group,mailing list or even per domainusing the IceWarp Admin Console (GUI). However, it is sometimes easier to use the tool command line to fine tune or automatize service activation or desactivation. To do global changes, you can use the command line tool.exe, found in Icewarp's root directory, which lets you access the API directly. You can look at the option list in the IceWarp Server API Reference manual . Look for the desired constant you want to change, for example the option where you can enable or disable Anti-Spam is called U_AS and the service for quarantine isU_Quarantine.